It’s no secret that lots of crafters are supply hoarders. Quilling paper artists are no different! There is always the newest tool or another pack of paper strips to buy. It is easy to get overwhelmed! But a newcomer to quilling doesn’t really need many supplies at all! Today, I’m sharing the essential toolkit for quilling beginners so all newcomers can get started now! Obviously, there is no quilling without paper! Quilling paper is a little difficult to find in stores, but it is available by the tons online. Every color and shade, multiple lengths, thick and thin. You can find it all. Many experienced quillers prefer cutting their own strips, but for now, buy a bunch of packs of paper and just start quilling! Yes, you can make due with a wooden dowel or a toothpick, but for under $10, you can pick up a needle tool and a slotted tool. Grab them both and see which you like better. If you need some tips on which tool to use, check out this post on the difference between the two tools. Glue is another supply that all quillers have a personal preference about. I mostly use regular, old extra-strength white glue. It dries quickly but is still moveable for a few moments. I also like to have some Tacky Glue around for 3D quilling and a small bottle of clear glue for gluing black strips. There is really no need to get fancy with your glue! A glue bottle with a small nozzle is another item you can pick up for a couple dollars that will make your quilling much more efficient. Fill it up once every few weeks, and you’ll be able to glue your shapes and strips quickly and easily. If you tend to make a mess with your glue, this one is for you! Now, I went without using needle-nosed tweezers for a few years, but when I finally got some… I was amazed at how handy they are! I use them constantly to pick up small coils, to work in tight spaces, or to hold strips in place while they dry. I can’t recommend a cutting mat enough! I keep one on my workspace at all times, so I can quickly lay a strip down and tear off exactly what I need. No more hunting for a ruler when I’m trying to keep all my strips the same length. The mat is in front of me all the time! At this point in my quilling journey, I have quite a collection of corkboards to work on. Corkboards are really useful to build your quilling masterpieces on and to pin pieces together while they dry. And I think for the beginner, a really handy tool is a board with a coil template on the back. Once you get the basics of quilling down, you can start gathering more fun supplies, like quilling combs, fingers and molds. Are there any other basic quilling tools that you really love? Leave a comment below! I haven’t done quilling in so long and miss it. I was happy to see that I have all the things listed in your essential tool kit. I think that quilling would be wonderful on my handmade greeting cards. Thank you for your post. That’s wonderful, Pat! Quilling and cards are a perfect fit! Check back in if you can and let me know how it is working out. I use toothpicks to apply the glue. I put a small amount of the glue in a 2lt bottle cap so I don’t accidentally get glue on my fingers or elsewhere. I also use small sharp scissors to trim uneven rolls. I’m a newbie so my work isn’t perfect yet. But I love quilling! Thanks for your posts. Thanks for the tips, Pat! I have used toothpicks in the past, but I always ended up with a big blob of glue on the end. Scissors are really handy, too! 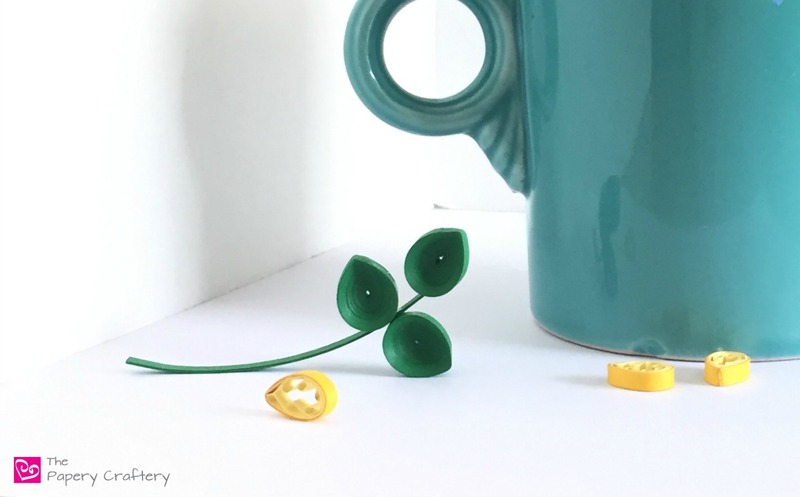 I’ve just recently learned about quilling, I might have to try it out! Thanks for the tips! I do think quilling is starting to gain in popularity again. I hope you will give it a try. It’s so simple to start! I have been wanting to start this. Thanks for the great info! You’re so welcome, Celeste! I hope you find it helpful! Love all your post and designs, you sure have a talent. I hope I can get as good as you. I’ve only been doing it for a few months, and you are correct it is easy. I still have some trouble with some odd shaped ones. Thank you for the kind words, Laurie! I’m sure your quilling is coming along nicely. And you’re right, some of those odd shapes can be tricky! I started quilling a few months back but the swirls were my most difficult to get right. Thank you so much for these instructions, you make it look so easy. Much appreciated. That’s so great to hear, Debbie! Swirls were tricky for me for the longest time, too. I’m so glad you’re finding some useful info here!